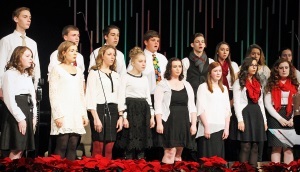 Choir provides opportunities for students to learn about and perform advanced music in various voicings and styles. 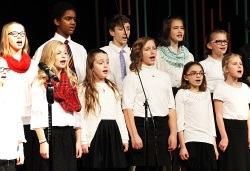 Students will perform a broad range of choral literature and learn fundamentals of proper vocal production, musical expression, and sight-reading. Students in choir minister to themselves and others in song, action, and attitude. The choir requires some time outside of class for certain projects, depending on the year. Students do not need to audition or sing solos to be in choir. Attendance is expected at all performances. KnightSingers- is a select, auditioned group of committed students interested in performing more advanced literature. Students will represent Fairfield Christian Academy in addition to the choir and the group does require some time outside of class. Students will be selected on the basis of ability, including intonation, vocal quality, expression, projection, part independence, blend, and reliability. This is an education option of God- given talent and ability, honor, service, and responsibility. Students earn an extra half credit for the class, and meet 2 days per week during the lunch period. Join us for our Annual K-4th Grade FINE ARTS EVENING, coming in February!